Faster return on investment through implementation of rapid project delivery and zero defect construction by robot oriented design and automated construction systems. 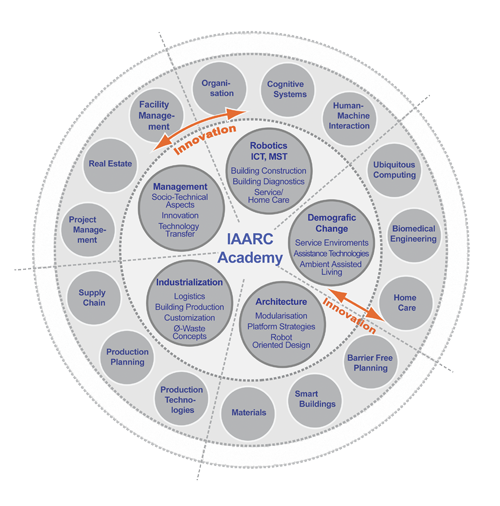 The participants of the IAARC courses acquire a complementary knowledge in design, production, assembly, logistics, and management emphasizing on information, communication, automation, robotics, mechatronics, and service technologies. Microsystems and microelectronics increasingly form a part of our everyday’s life. Its miniaturization allows its incorporation in domestic systems and appliances. Simultaneously we want to deal with a standardized and compatible network of synergetic subsystems rather than detached island solutions. On top of conventional construction planning, engineering, and management, these new technologies require an even more complex project management capacity for interfacing the various frontier science disciplines. In order to incorporate mechatronic technologies in intelligent living environments the participants acquire basic knowledge of microelectronic systems and ICT. The courses follow a holistic approach: The deployment of new technologies is considered in each phase of life cycle originating in marketing and project development till re-use and disassembly. Due to the elementary approach of open systems and subsystems, the life cycle of a building can be extended by upgrading or repairing one element without destroying the whole system. This approach is common in aero space industries and in advanced car concepts such as Toyota’s Prius, where 95% of the car is recycled. To achieve this in construction industry, secondary resource utilization helps increasing the total resource efficiency of building performance. The participants apply not only management of technology, processes, and projects, but also its technological interdependencies and socio-economical boundary constraints in order to create substantially new solutions. By studying intercultural cases in design, production, and management the participants get acquainted to cross cultural experiences for future professional and international career.